Cazcomics is a wife and husband team, Carole writes and Steve draws. A cartoon strip about Caz and her family. 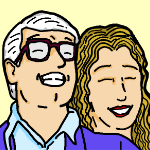 Written and drawn by a wife and husband and loosely based on their family life.